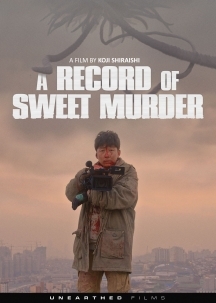 From Koji Shiraishi, director of GROTESQUE, NOROI THE CURSE, THE SLIT-MOUTHED WOMAN and SEDAKO VS. KAYAKO comes A RECORD OF SWEET MURDER: Sang-joon has recently escaped from a mental institution and managed to amass a kill count in the high teens, a South Korean journalist and a Japanese cameraman are invited to an abandoned apartment to interview the murderer. They believe the wanted criminal has committed 18 murders, but the criminal claims he has already killed 25. He furthermore claims that if he completes the killing of all 27 on his list, not only will his dead friend be resurrected, but also all 27 will come back to life. This claustrophobic psychodrama unfolds as a grisly single take for much of its running time. The movie revolves around a man's deadly obsession with finding salvation through pure love, which somehow entails subjecting victims to violence -- and even killing them.